Location : 0.61km from city center, Meow Meow Cat Cafe is located above the Pet Zone (pet shop). It is accessible from major road from Jalan Green and Jalan Satok. The Meow Meow Cat Cafe is located above The Pet Zone pet shop. to enter the cat cafe you need to use the stairs inside the pet shop. * First drinks : Coca Cola, Sprite, A&W, 100 plus, Coffee, Ice Lemon Tea, Organic Green Tea, Mineral Water. The Meow Meow Cat Cafe is a subsidiary of The Pet Zone, opens to public since 30th August 2014. It is the first cat themed cafe in Kuching. The concept of cat cafe came form various famous pet themed cafe in Taiwan, Japan, Asian and Europe countries. It is very popular for pet lovers and youngsters. Personal with asthma, airway diseases or allergy to cat fur is not encourage to enter the cat rooms, but they can stay outside the cat rooms and look at these adorable felines. You may have cat fur over your clothing after playing with the cats. Meow Meow Cat Cafe is a simple cat themed cafe that is suitable for family gatherings, and couples meet ups. The environment is cool with warm lighting, specious area and beautiful cats ornaments. There are also books and magazines for animal lovers at one corner. The main counter of cat cafe is full of cat ornaments. Comfortable cafe environment and warm lighting. The cute couple cat mural on the wall of the cafe. The artistic cat artwork on the wall. They also offer simple menu for breakfast and lunch. You won’t expect exaggerated choices of food here, as the main attraction is about the cats. Simple western food and snacks. 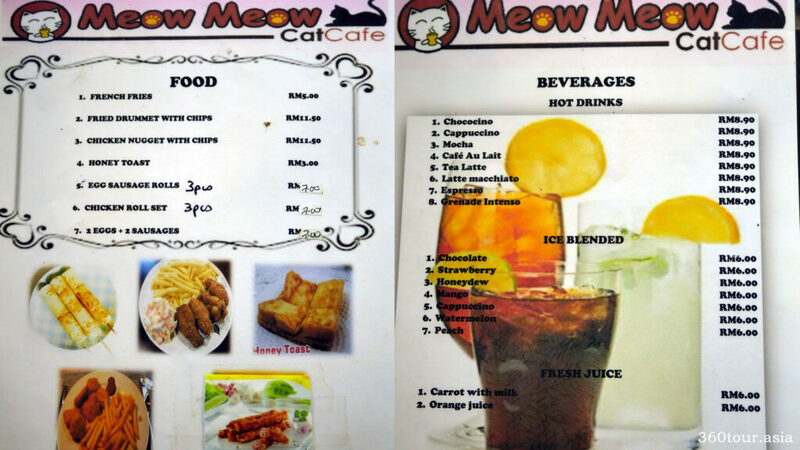 The food and drinks menu of Meow Meow Cat Cafe. The included drinks menu for those who wish to go in the cat room. There is a separate drinks menu for those who wish to go into the cat room. The package is RM10 per person. The cat room is an isolated room with glass doors. You can see those cute felines without paying the entrance fee. The room is equipped with air filter and air condition to provide a clean and comfortable place for the visitors and the cats. Safety of the customers and well-being of the cats is also of much emphasis. Visitors entering the cat room need to remove their shoes and hands needs to be sanitized with the hand sanitizer provided. There is also in house rules on how to handle the cats. The cat room is an isolated room from the dining room. Meet the feline stars of Meow Meow Cat Cafe. However the available of the Feline stars is depends on pet conditions. The feline stars of Meow Meow Cat Cafe. The play tower for cats. One of the toys for the cat – the rat. The cat ornaments on the shelf. For those who are interested with the cat toys and play house can visit their pet stores at ground floor. It is an indirect way of promoting the cat merchandise too. Most of the cats are friendly too. They do purr around your legs. You can play cat toys with them and see them reacting to the toys and racing for it. Some of the cats are passive. The cats in the cat room. The cute feline looking at you. Cat resting on the comfortable chair. Cat stretching on the couch. Just woke up from sleep. Is feeding time for the cats. Do bring your family and friends here and visit these cute felines.